Boasted as the tallest media façade, the Burj Khalifa in Dubai, UAE, features a light-emitting diode (LED) screen that runs up 770 m (2526 ft) of the 828-m (2716-ft) tall tower. EMAAR Properties Dubai, along with SACO Technologies and its local partner 3S Lighting Solutions, are celebrating the one-year anniversary of their record-setting initiative to light up the east façade of the Burj Khalifa, giving it high-resolution video capability across the height of the tower. The light-emitting diode (LED) screen runs up 770 m (2526 ft) of the 828-m (2716-ft) tall tower, was unveiled at the ‘Light Up 2018’ New Year’s celebration captivating millions of viewers, including those who attended the event and those who streamed the live broadcast around the world. The groundbreaking lightshow established a new Guinness World Record for the largest laser light and sound show on one single structure. 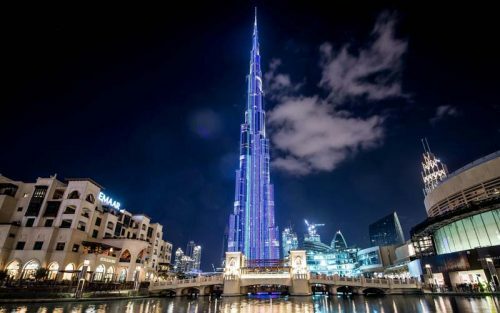 EMAAR, a real estate developer in the UAE, and owner/operator of the iconic building, commissioned SACO Technologies and its local partner, 3S Lighting Solutions, to design and create a system that would seamlessly integrate within the architecture of the building. The initiative took six months from design to install and includes more than 28 km (17 miles) of SACO’s V-Stick—a compact, easily dissimulated video fixture using high-performance LEDs to deliver uninterrupted lines of light—that becomes part of the architectural detail. Copyright ©2019 Sign Media unless otherwise noted.